There is some good news for marketers today: budgets and staffing are on the rise as the economic recovery continues. However, marketing investment growth has not kept pace with revenue growth and many marketing executives are still working with fewer resources than they had prior to the recession. They simply don't have enough people or program dollars to achieve lofty marketing and sales goals, and there is increasing pressure to deliver higher ROI. In order to impact the bottom line for their companies, marketers must leverage the most effective tools to reach audiences throughout all phases of the purchase funnel. Webcasting is a scalable solution that enables marketers to educate prospects, nurture leads, and retain customers without draining valuable staff time and travel budgets. 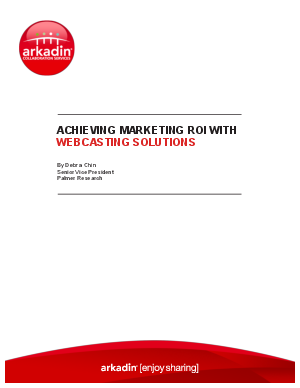 This white paper outlines how marketing professionals can use webcasting solutions at each stage of the purchase funnel to achieve their organizational goals and maximize marketing ROI.